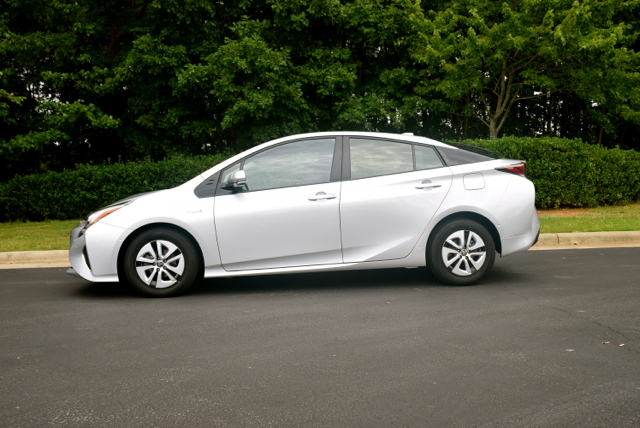 This 2016 Toyota Prius is part of a #TriPrius marketing campaign for the Raleigh, NC area. This week, one of my fleet vehicles is none other than a 2016 Toyota Prius Four. Unlike the other vehicles I typically test, this one is being reviewed as part of a Toyota Triangle campaign from Southeast Toyota Distributors, LLC. 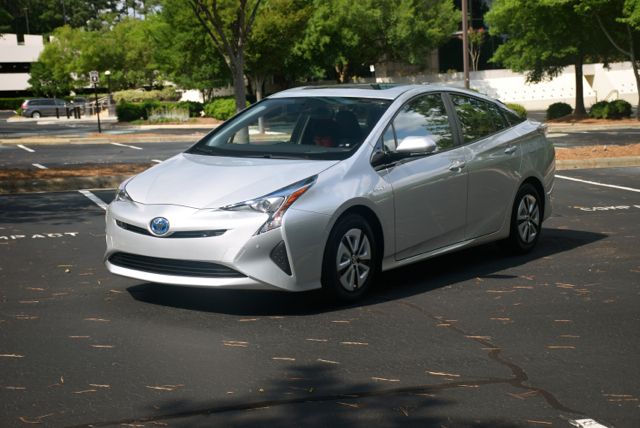 Along with nine other drivers, we’re showing off the Prius to everyone we know in the Raleigh, Durham, and Chapel Hill, NC, area (Research Triangle Park). Therefore, instead of my usual journalism perspective, I’m very much wearing my promoter hat. Toyota isn’t paying me for my comments, but there is a good chance that if I make enough noise through a #TriPrius campaign, a local charity will benefit. More details to follow. As for the 2016 Toyota Prius, it is all-new this year. Now in its fourth generation, the hybrid electric vehicle Prius offers the edgiest design yet as evidenced by the photos I’ve included here. 1. Released in 1997. Although the US did not see the first Toyota Prius until late in 1999 for the 2000 model year, this model went on sale in Japan in 1997. The first-generation model was sold through 2003 and was a compact. Beginning in 2004, a larger second-generation model rolled out and in 2010 the third-generation Prius was introduced. As mentioned, 2016 marks the start of the fourth-generation model. 2. The top-selling hybrid model. Thus far, Toyota has sold more than 5.7 million Prius models worldwide. 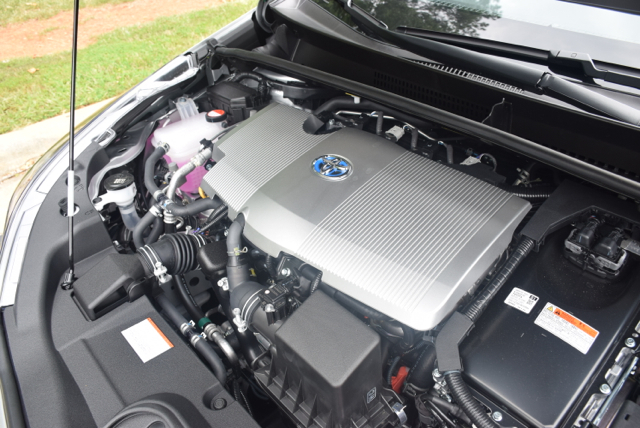 It remains the best-selling hybrid model in the US and is joined by other hybrid Toyota models, including the RAV4 Hybrid, Avalon Hybrid, and the Camry Hybrid. 3. Fuel economy is better than ever. Always seeking to maintain an innovative edge, the 2016 Prius is EPA-rated at 54 mpg in the city and 50 mpg on the highway for a combined 52 mpg. A special Prius Two Eco edition raises fuel economy to 58 mpg in the city and 53 mpg on the highway for a combined 56 mpg. That’s the best gas mileage you’ll find on any car sold in the US — not bad for a five-passenger vehicle the EPA classifies as a midsize model! 4. Six trim levels offered. 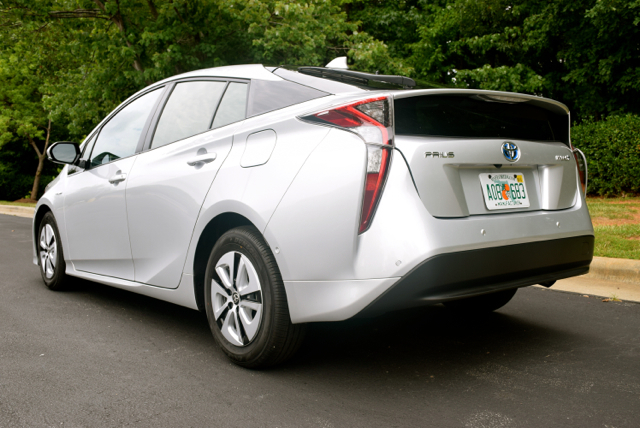 Leave it to Toyota to come up with easy to remember trim levels for the Prius line. The base trim is called the Prius Two and it is followed by the Two Eco, Three, Three Touring, Four, and the Four Touring. The base price comes in at $24,200 and rises to $30,000 for the Four Touring. Choose every conceivable package and option such as the Premium Convenience Package ($1,705), LED Illumination Package ($349), and a dual USB power port rear seat charge station ($119), and you’ll load up your vehicle accordingly. 5. Nifty tech features for your consideration. Have you ever forgotten and regretted not bringing your charge cord with you? I have. Now you don’t have to keep one handy as the 2016 Prius comes with a Qi charging dock. Standard with the Prius Three trims on up, a charge indicating light tells you when it is at work. 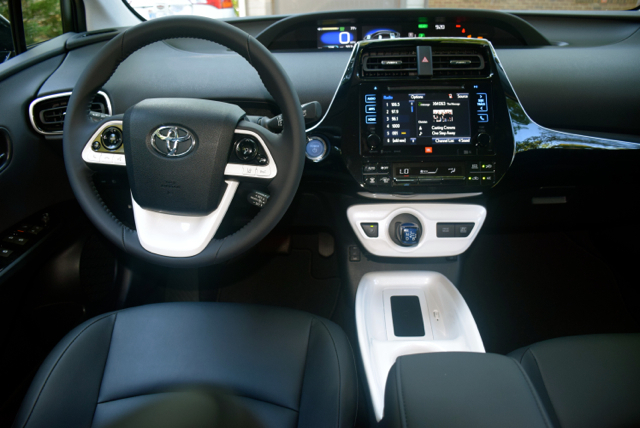 Other tech features include available automatic high beams, Siri Eyes Free, dual 4.2-inch thin film transistor multi-information display panels, and a 10-speaker Premium JBL audio system standard on the Prius Four. 6. Your safety is a priority. The Insurance Institute for Highway Safety (IIHS) has recognized the Prius with its Top Safety Pick+ award, its highest honor. This means the 2016 Prius achieved the institute’s highest score in all five crashworthiness categories. It also received a superior grade for its available front crash prevention system. 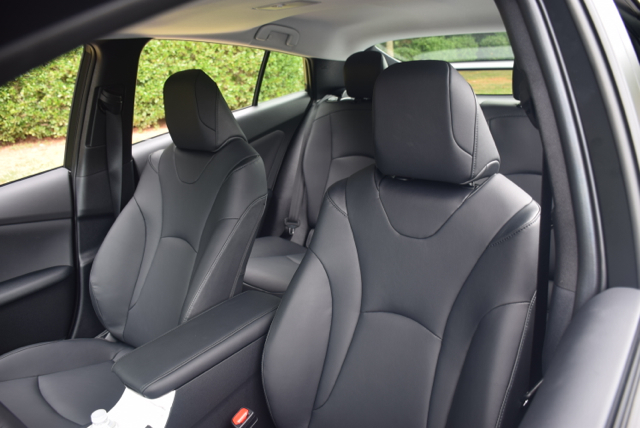 All models come equipped with a driver and front passenger advanced airbag system, as well as driver and front passenger front seat-mounted side airbags, passenger seat cushion airbag, a driver’s knee airbag, and front and rear curtain shield airbags. The two “touring” models also include Toyota Safety Sense-P (TSS –(P)) – representing a pre-collision system with pedestrian detection, lane departure alert with steering assist, automatic high beams and full-speed dynamic radar cruise control. A full review of the 2016 Toyota Prius will be published by the end of this month. Meanwhile, if you’re on Twitter you can find my updates via @theautowriter, where I share photos, industry news, and other snippets related to the auto industry. 2016 Toyota Prius Four photos copyright Auto Trends Magazine.